While X-rays are used in computed tomography to determine the attenuation values of a given object disturbing effect like scattering are filtered out because they lower the image quality of the reconstruction. With scattered or diffraction photons it is possible to distinguish between compounds by using radial distribution functions and molecular interference function algorithms to identify discrete molecular signatures in liquids. Spectral X-Ray Diffraction (XRD) allows a much clearer differentiation between substances than conventional transmission radiography. However, exactly these photons are very material specific in energy and the scattering angle. This can be used to identify the molecular structure of a sample as it is done in crystallography or biochemistry. Moreover, this effect is used in XRD imaging (XDi™) to detect multiple liquid explosive threats in containers and inside bags at safety checkpoints like airports with high throughput in a very limited amount of time. Since the attack on the World Trade Center in 2001 it is permitted to carry liquids in the hand baggage. 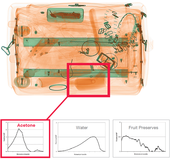 The X-ray Diffraction (XRD)-based imaging system can automatically detect multiple liquid explosive threats in containers and inside bags, so passengers do not have to remove carry-on liquids for screening. This technique will also be used for counterfeit pharmaceutics and detection of stealth bombs (e.g. lithium ion bombs) in the near future. The focus of this research project is to connect different modalities to enhance the detection performance and increase accuracy as well as create a complete diffraction framework for commercial usage. This is necessary due to the rather low photon count in XDi™. 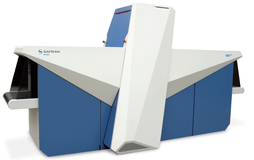 In the end, different techniques like common transmission, diffraction as well as dual energy tomography are used to extend each other in a certain way to detect threats in the passengers’ baggage. The project is supported by Morpho Detection as part of the Safran Group, the Purdue University, Duke University and GE Global Research. Isernhagen, C. F., Schäfer, D., Grass, M. and Buzug, T. M.: Three-dimensional anisotropic regularization for limited angle tomography, In: Current Directions in Biomedical Engineering, 283-285, 2015, DOI: 10.1515/cdbme-2015-0070.